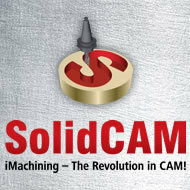 Event location: Las Vegas, U.S.
December 2nd - 4th, 2014 Las Vegas, U.S.
SolidCAM with iMachining demolishes Competitor CAM. iMachining great success on a Mill-turn Okuma Multus machine.. 58% saving on turbine blade. ...I used iMachining 2D &3D and the cutting time at the end was 34 min, down from original 80 min, which is far beyond the end user's expectations (58% saving).